Back in April, I found a small cluster of Potato Dandelions, Krigia dandelion, growing on the site of a storage shed that had burned around 40 years ago. The plants apparently grew from tubers taken by a Chipmunk from one of my garden containers and buried here. 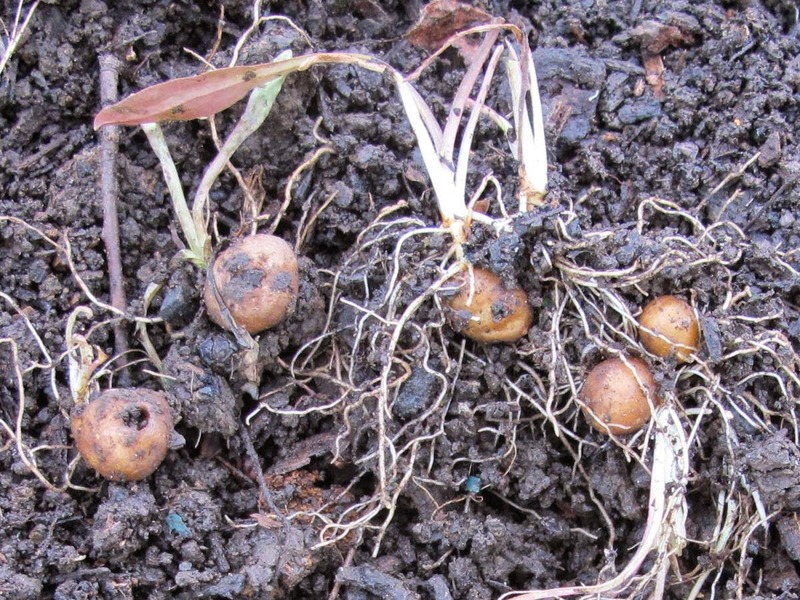 In total, I recovered nine little tubers. 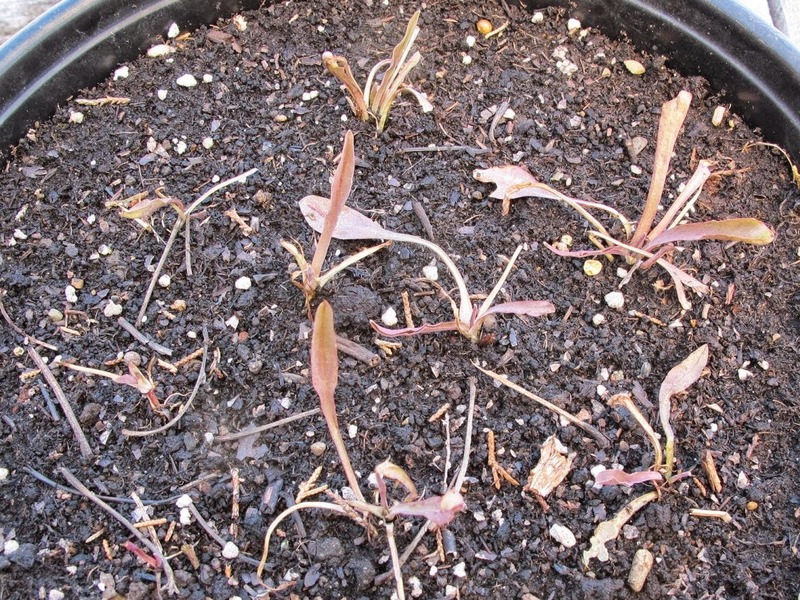 The Potato Dandelions were planted into a seven inch diameter plastic container filled with used potting soil. The plants prospered. By the middle of May the pot was full of growth. The leaves yellowed in June and began to wither. By the end of July, no signs of top growth remained in the pot. This is normal behavior for the Potato Dandelion which is a cool weather species that enters dormancy for the summer season. 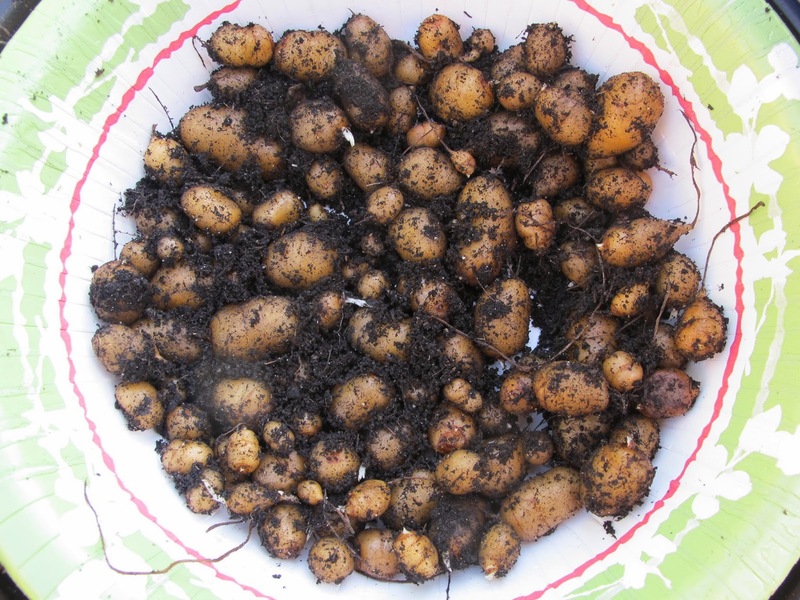 I just recently emptied the pot and collected the tubers. All of these were produced by those nine plants in just one growing season. I decided to set these free and plant them back into the woods. I’ve had poor luck introducing Potato Dandelions into the wild. This may be because I’ve planted them into sites where I thought they should do their best growing. 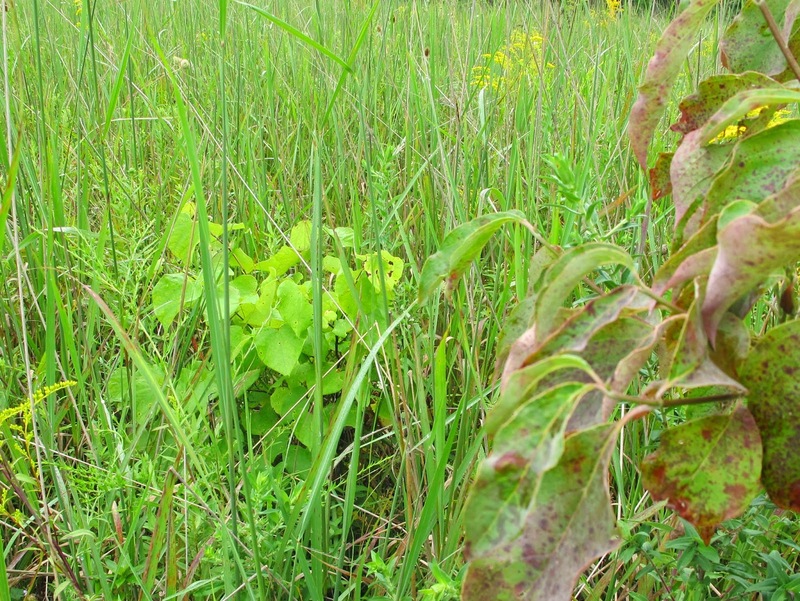 The most vigorous plants develop in areas with the most sunlight, but those are not the conditions at the original site of the Blue Jay Barrens Potato Dandelions. 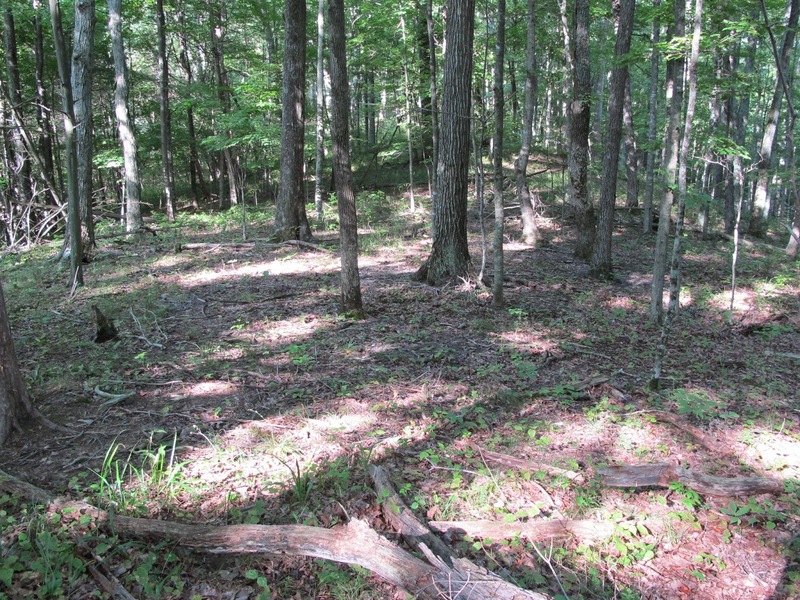 Those plants are growing in the woods in dry, ridge top soils very much like this site located about a quarter of a mile west of the original. The ground here looks identical to the original site. Same type of soil, same mix of trees, and same lack of heavy ground cover makes me think that this could be the place to successfully introduce Potato Dandelions. I worked my way along the ridge top planting the tubers in groups of three wherever conditions looked right. I drilled a small hole with my knife, dropped in a tuber and covered it up. This may be the tuber that begins a new population. 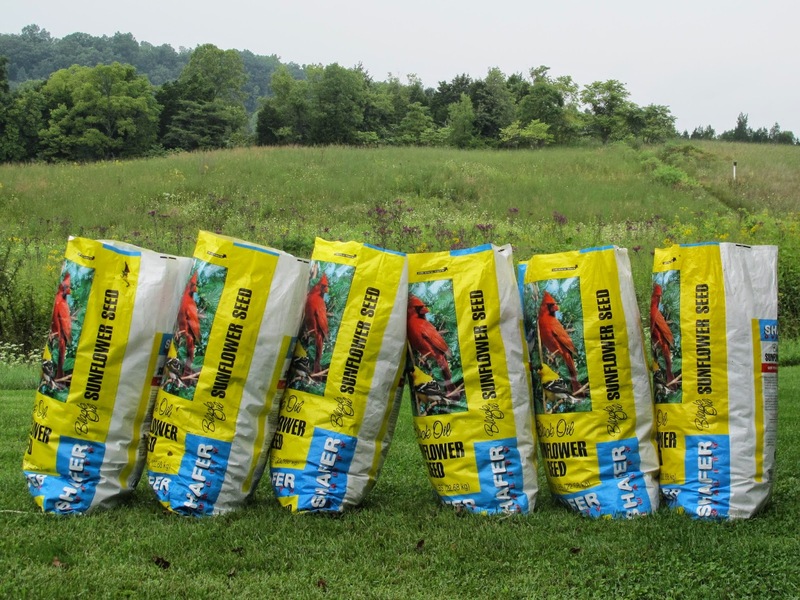 I don’t bring in any plants or seeds from outside Blue Jay Barrens, but I do work to increase the populations of plants that are already found here. Especially with the rare species, I would like to have several populations scattered about the property just in case something horrible happens to one. 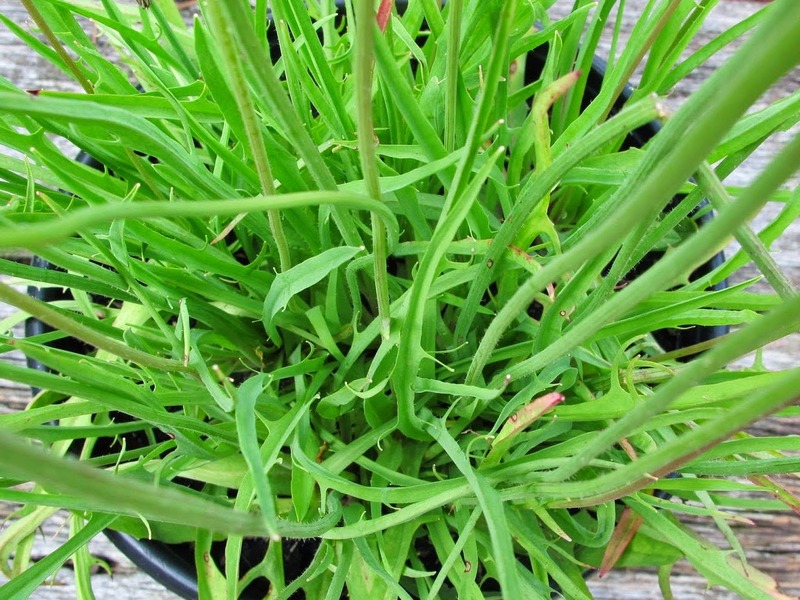 It’s fortunate that the Potato Dandelion produces so well when grown in a container. I’ll always have plenty of tubers to experiment with. 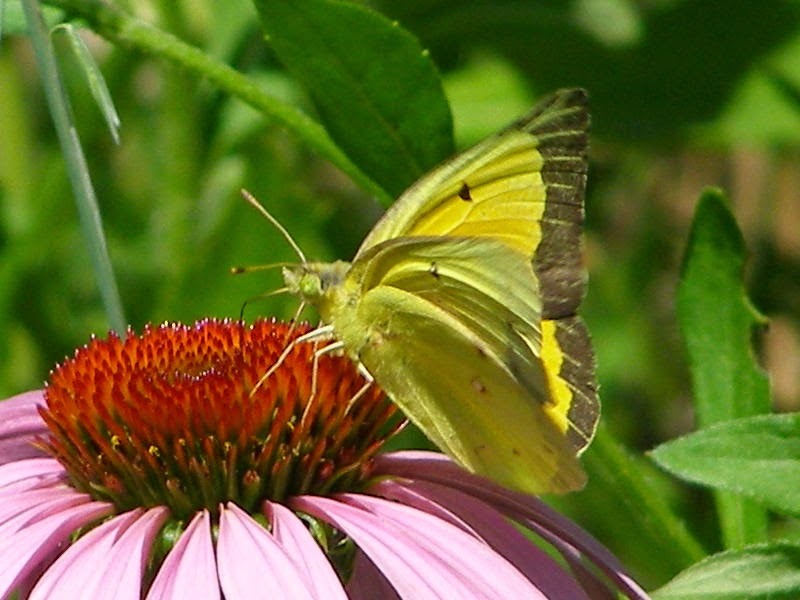 Even though it is a most common butterfly throughout the State of Ohio, the Clouded Sulphur butterfly is an uncommon find at Blue Jay Barrens. 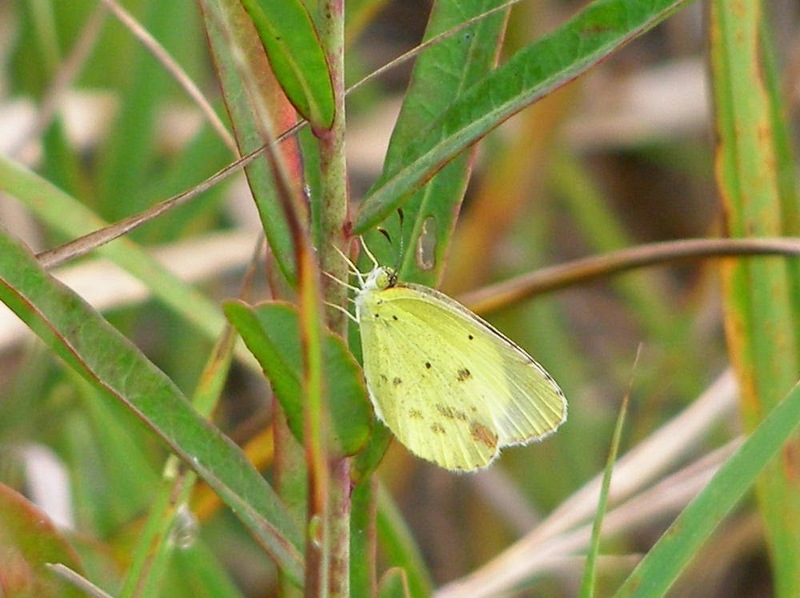 That is most likely because the Red and White Clovers upon which the Clouded Sulphur caterpillars feed is practically absent on this property. During my childhood, Clouded Sulphurs were a particular favorite of mine. No matter where we happened to be living, nearby agricultural fields abounded with Red Clover and with that plant came the butterflies. My net captured hundreds of this species, which I would inspect closely and then release. 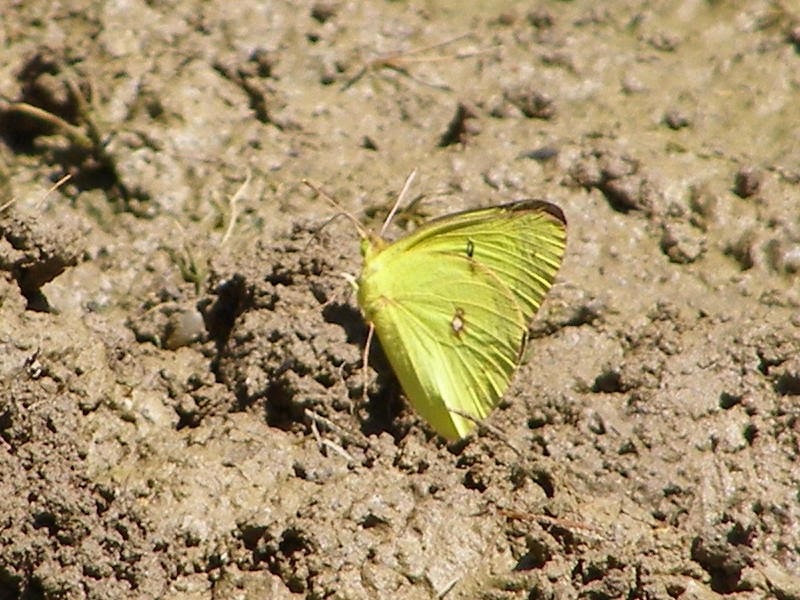 Clouded Sulphurs are common puddlers and will often blanket a small patch of mud. I used to race through mud holes, raising clouds of butterflies. It is fortunate that these butterflies are so quick to return to their mud. As an eight year old, I had little patience for waiting on butterflies to regroup for my next run. 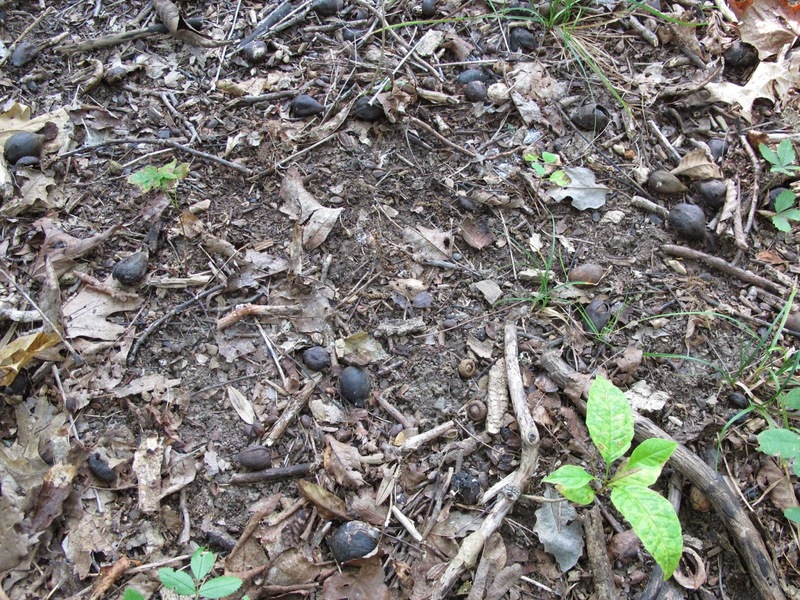 Mud holes are also uncommon in the well drained soils of Blue Jay Barrens. 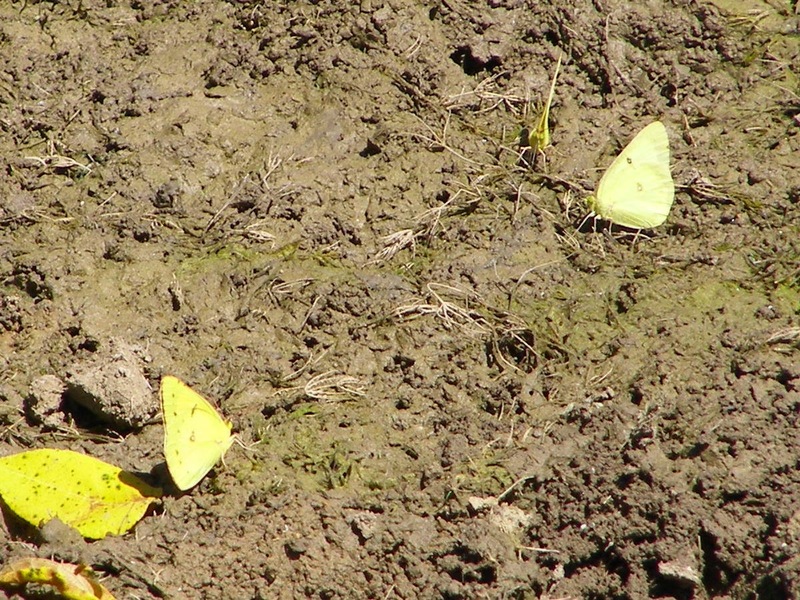 The pond bottom is about the only decent place for puddling butterflies to gather. Besides the resident Clouded Sulphur, Blue Jay Barrens has a couple of migrant Sulphurs that show up each summer. 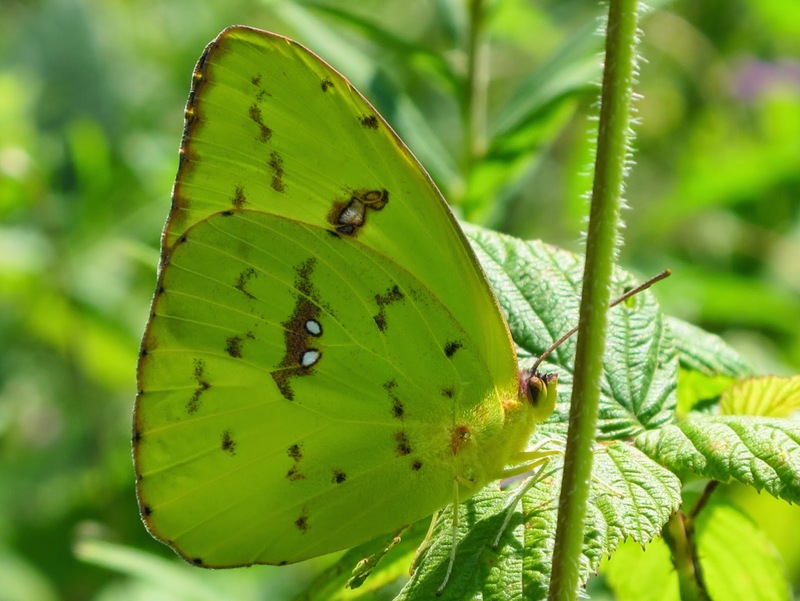 This is the Cloudless Sulphur, a species that regularly shows up here in August. 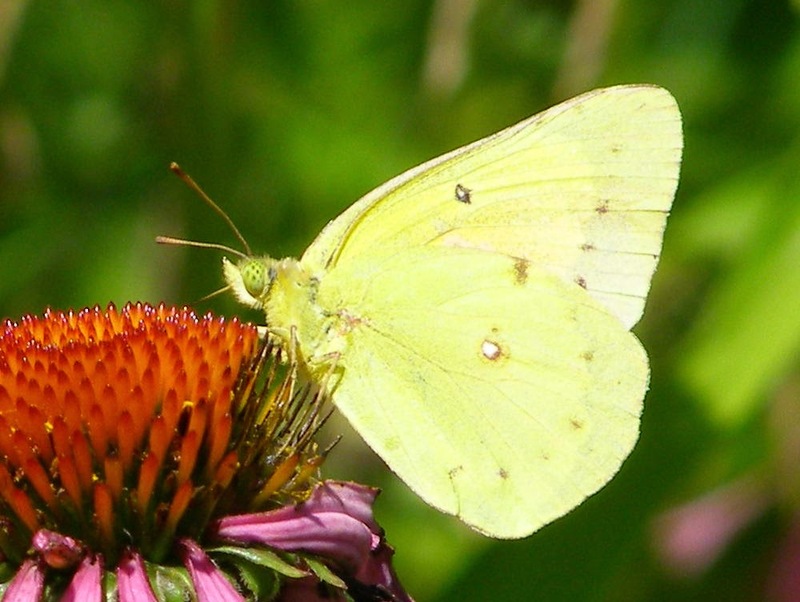 The largest of the Sulphurs, this butterfly presents a bright lime-green appearance when in flight. The large spots on the wings identify this individual as a female. 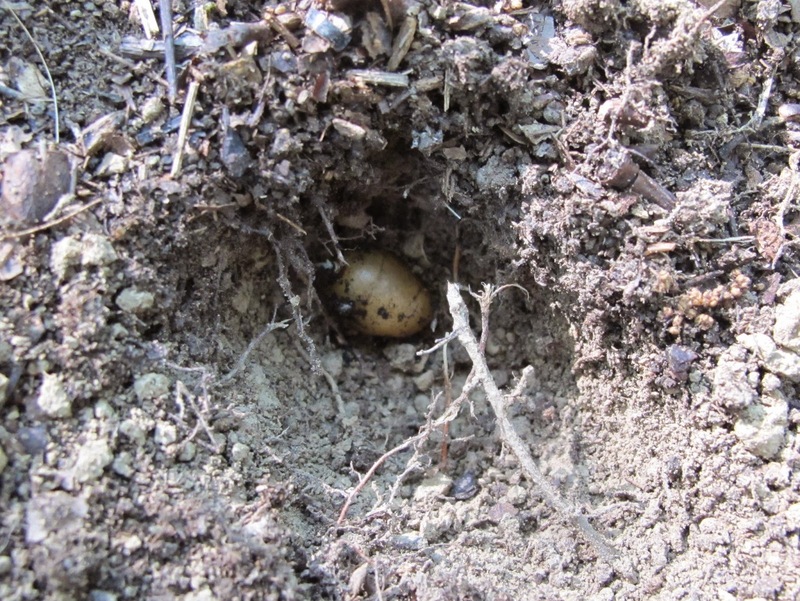 It’s possible that she will deposit eggs on some of the abundant Wild Senna growing in this field, but none of her offspring will survive the winter weather experienced in this area. Next year’s Cloudless Sulphurs will come here from southern states with milder winters. Thistle flowers are a favorite of this species. These butterflies fly much faster than the average person can travel through the field, so chasing one down is problematic. 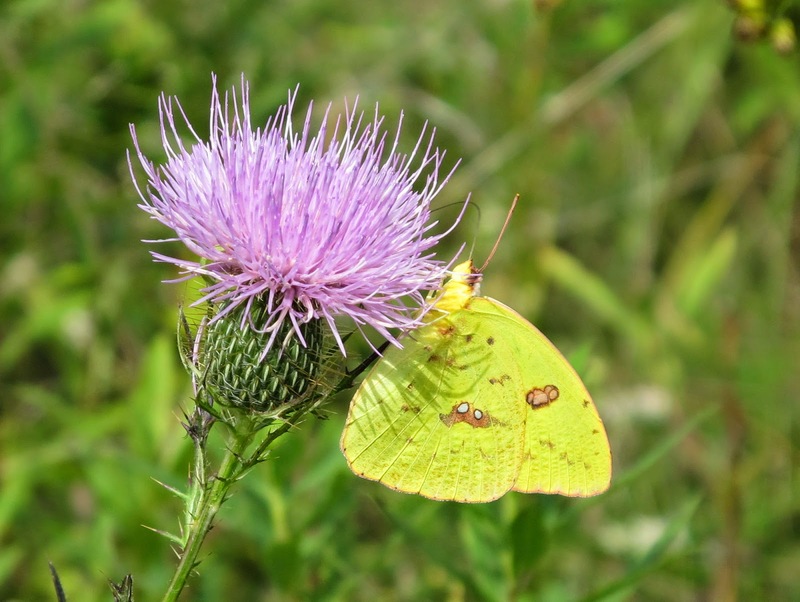 The easiest place to view them is on thistle flowers. 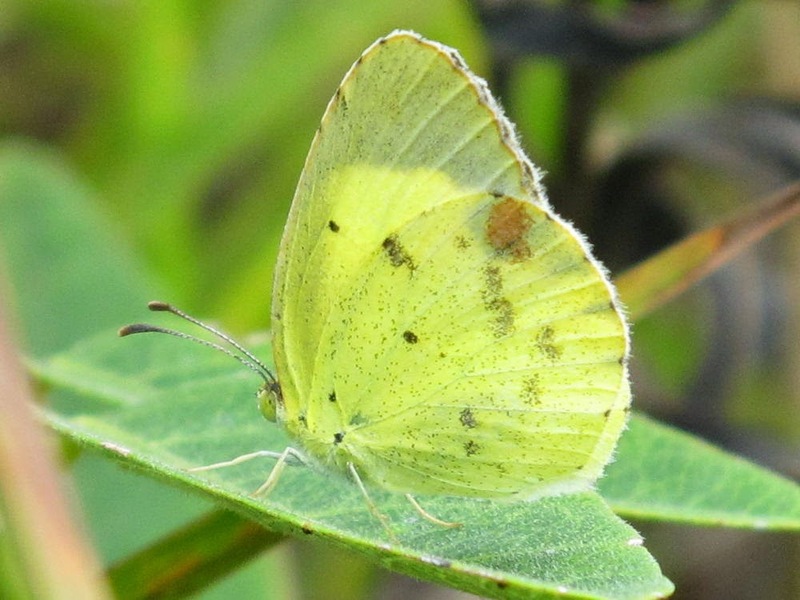 The Little Sulphur is the smallest of the Sulphurs. It flies close to the ground and weaves its way through the tall vegetation. Its small size makes it appear quite moth-like as it moves from one location to the next. 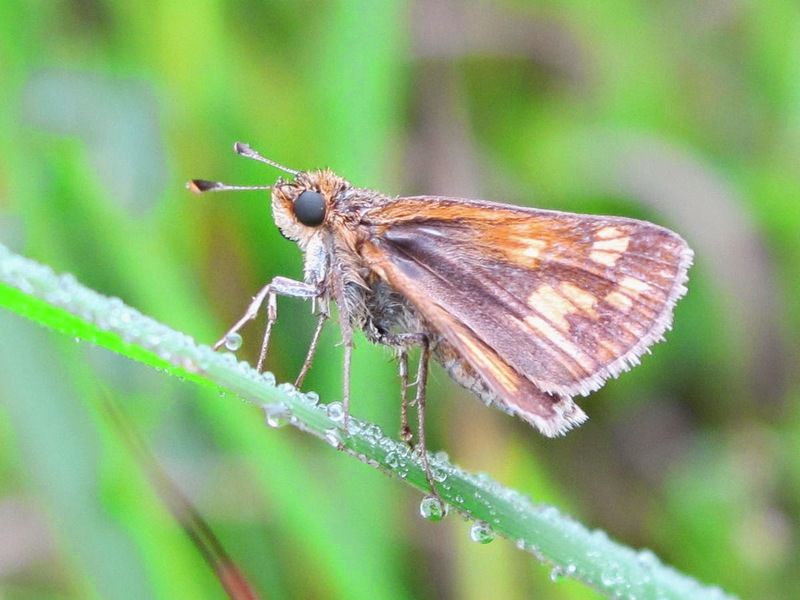 The best time to view this species is early in the morning, before the dew dries and the butterflies warm up. At that time, disturbed individuals will only move a short distance before settling back down. This is another migrant that moves in each year from more southern states. Perhaps one day it will actually be a resident of this area. The 2014 Teasel seed head collection filled six feed sacks. 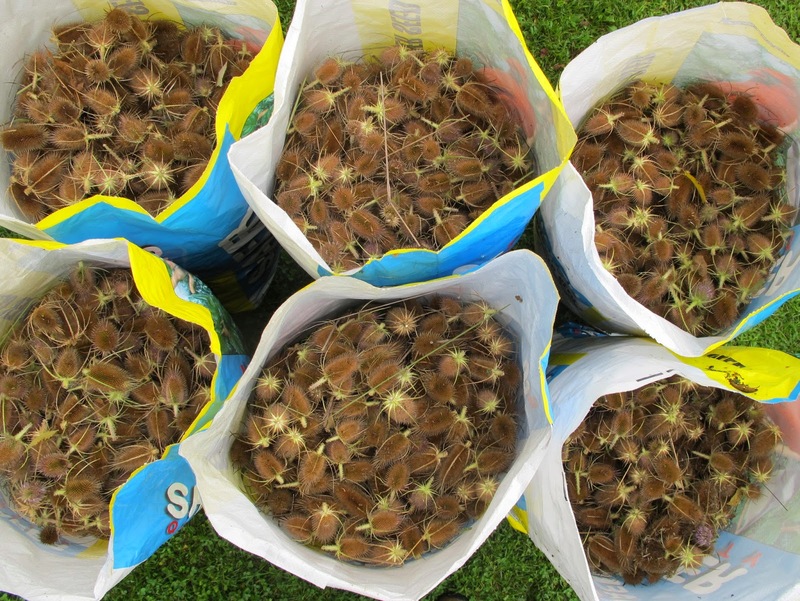 I stomped the seed heads together with my boot as they were dumped into the sacks, so each sack is tightly packed. This collection was made from an eight acre area of old crop fields that represents the extent of Teasel infestation at Blue Jay Barrens. Time spent collecting was just over 16 hours spread over five days. 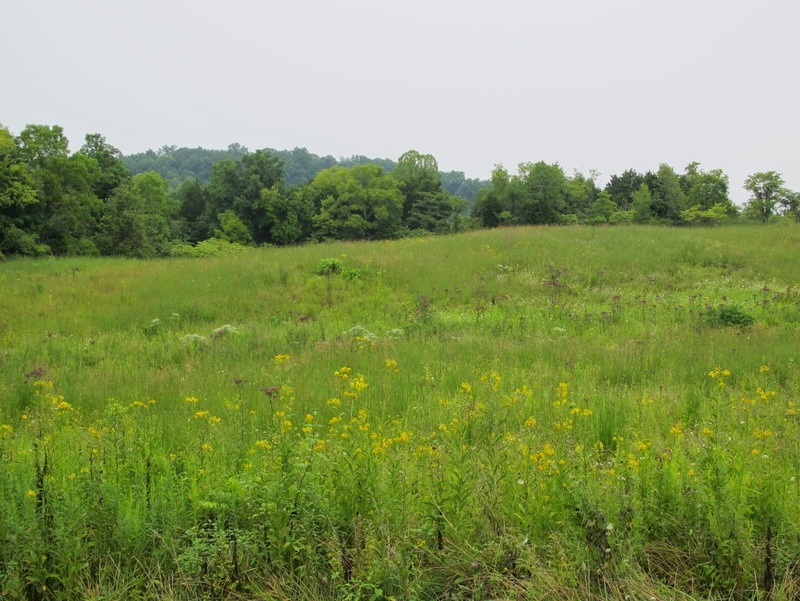 This two acre field directly behind the house was part of the collection area. Even though I know that Teasel still persists in the field, I’m not constantly reminded of the fact by the sight of Teasel seed heads standing tall above the other plants. I learned long ago that work in areas that I see most often should be placed as top priority. I took a few minutes to walk around and enjoy the view of late summer fields without visible Teasel. While dealing with this batch of Teasel at the base of an active ant mound, I found myself acting out the classic ants-in-pants comedy routine. I must have been standing on one of their foraging trails, because it only took a few seconds for a dozen or more ants to crawl up inside my pants leg. Allegheny Mound Ants have powerful jaws that can slice into the flesh, but it takes time for them to accomplish that feat. To make their initial attack more effective, the ants curl their bodies and apply a bit of formic acid to the wound they are making. The acid isn’t felt on bare skin, but causes a quick burn to even a minor cut. I’m sure my little bout of stomping, scratching and pants slapping would have amused even the most somber audience. It’s easy to locate the tall Teasel. 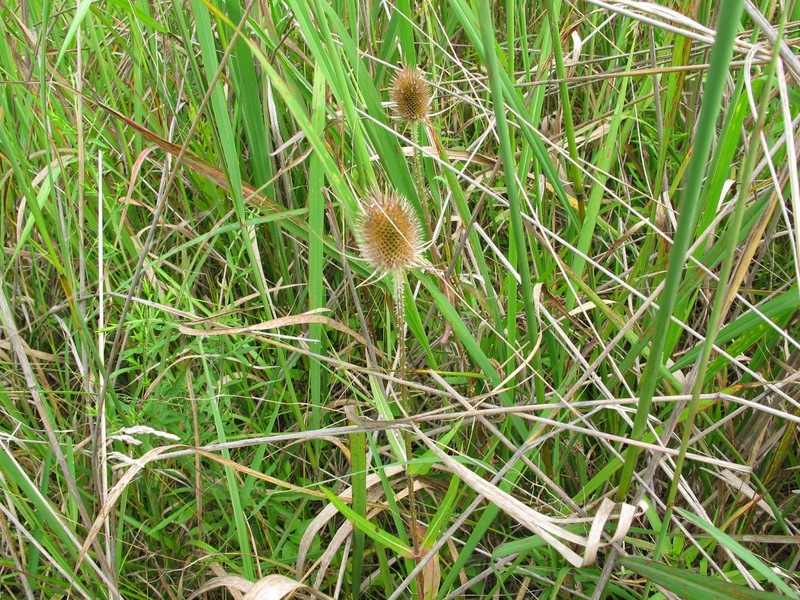 The trouble is finding short growing Teasel hidden by the taller vegetation. I collected many seed heads from plants that were not much taller than 12 inches. I’m sure many of these short plants were missed and their seeds will likely reach maturity. While working, I had visions of a future where my fields were infested with dwarf Teasel, descendents of the short Teasel that avoided my annual collection. My efforts yielded a total of 97.5 pounds of seed heads. After weighing a random sample, I estimated there to be 108 seed heads per pound. That means a total collection of 10,530 seed heads. 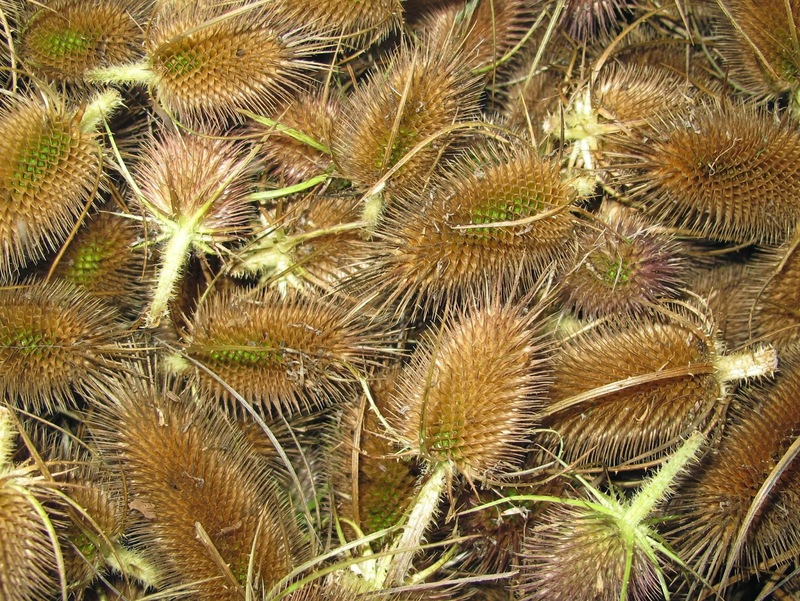 At an average 3.5 seed heads per plant, the total Teasel population was just over 3,000 plants. Examination of several seed heads provided me with an estimated 725 seeds being produced per seed head. 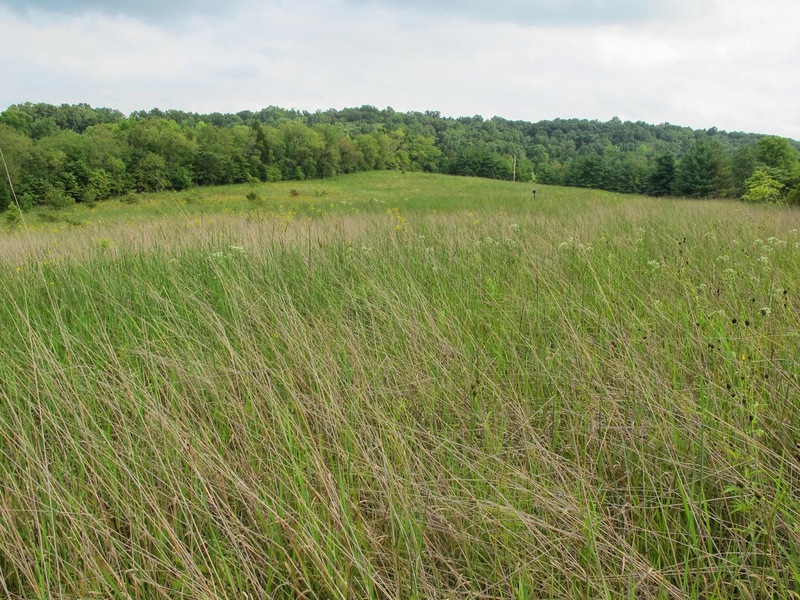 My seed head collection efforts resulted in more than 7.6 million seeds that have been denied the opportunity to produce new plants at Blue Jay Barrens. On my last day of collection, a thick fog persisted into late morning. Many flying insects were grounded as they awaited their wings and bodies to dry enough for flight. This makes it easy for a photographer to approach these normally wary creatures. 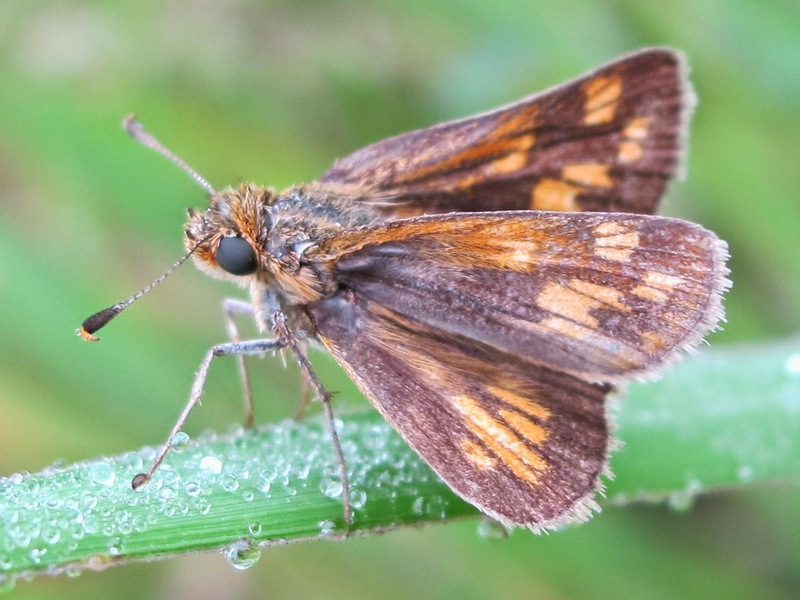 This Peck’s Skipper has its wings spread and is waiting for the sun to penetrate the haze and dry things off. 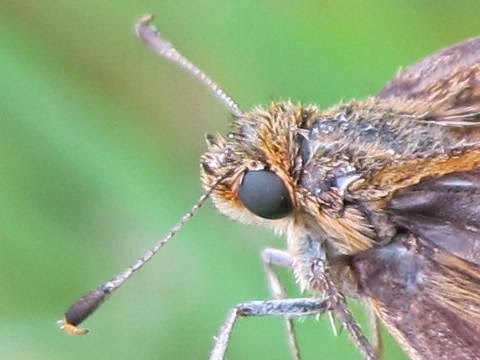 Skippers have a neat little hooked tip at the end of the antenna club that sets them apart from butterflies. The dew has this little fellow looking a bit ragged. I must admit that I looked in much worse shape than the skipper. The temperature was near 90 degrees, the air was perfectly still and the humidity level had to be over 80 percent. The combination of dew and sweat had managed to get me completely soaked and I had Indian Grass anthers stuck all over my face and arms. Fortunately, I always keep the camera pointed away from myself. I discovered many Monarch caterpillars as I traveled the fields searching for Teasel. 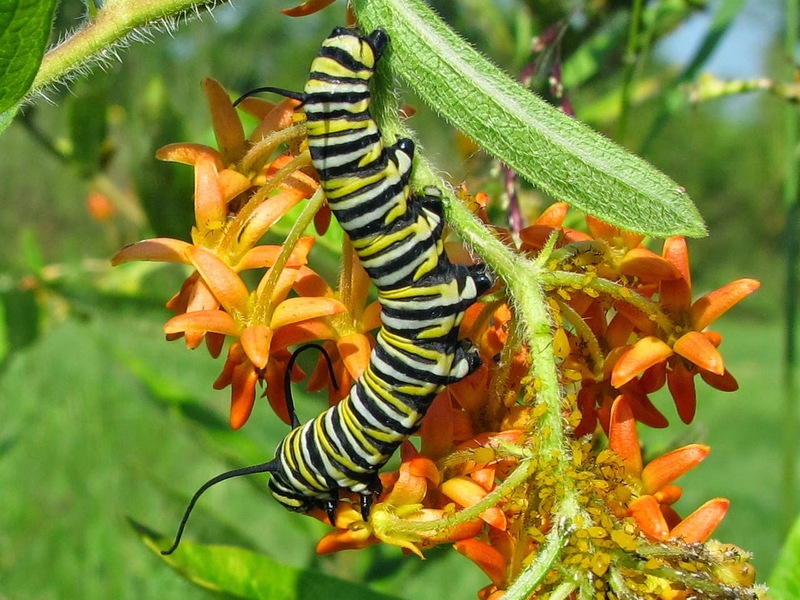 Most were on Butterfly Weed where they concentrated on devouring the flowers. 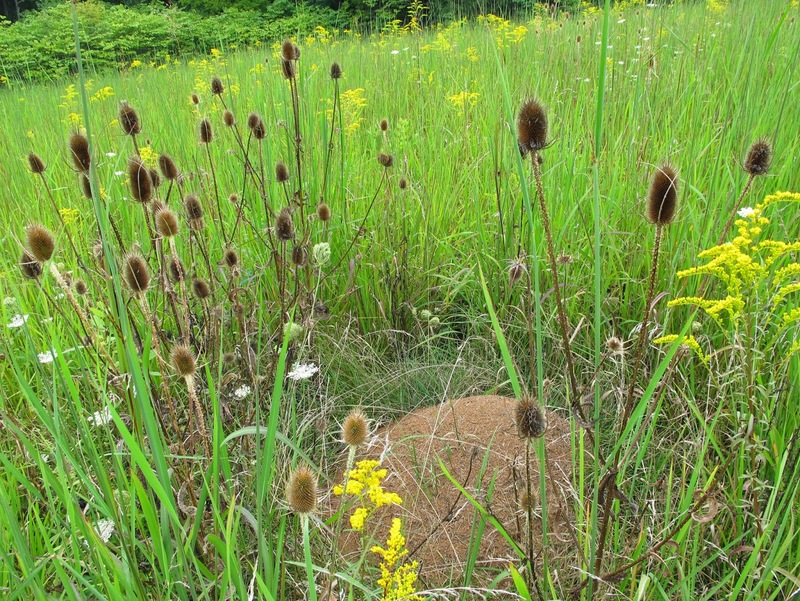 Teasel seed left on the ground can remain viable for as long as five years. I’m sure I’ll see a reduction in the number of Teasel plants before that time, but I’ll have to be vigilant in my seed head removal efforts for several more years before I can feel confident that any sections of the field have been rendered teasel free. 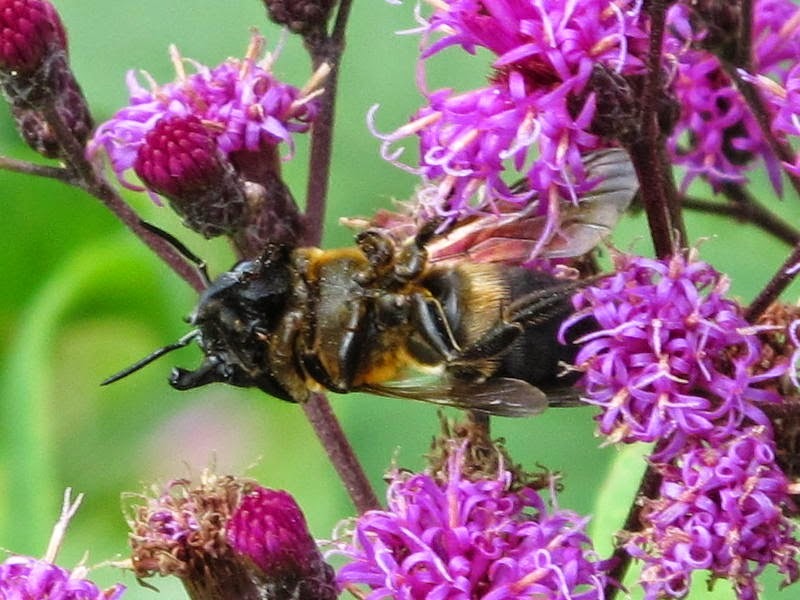 A loud buzzing drew my attention to activity on an Ironweed flower head. 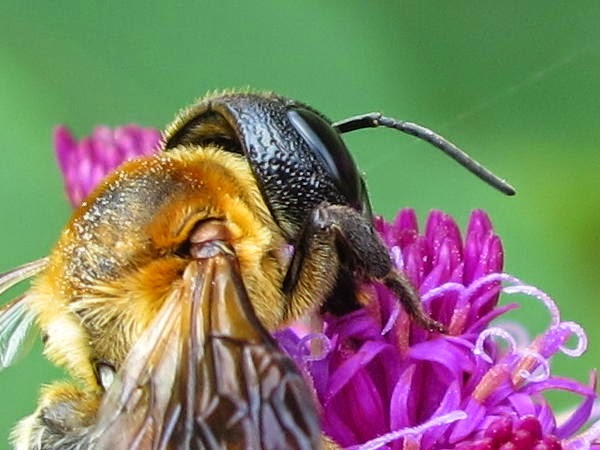 I snuck in close to observe this foraging bee. Hairless abdomen rules out Bumblebee. 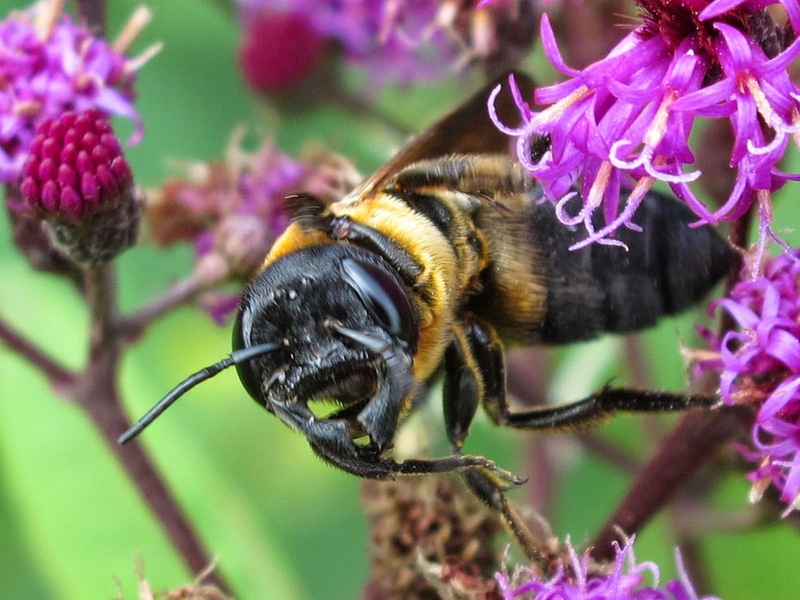 That left me with an identification of Carpenter Bee, but this specimen just didn’t look like the Carpenter Bees I’m used to seeing around the barn and house. 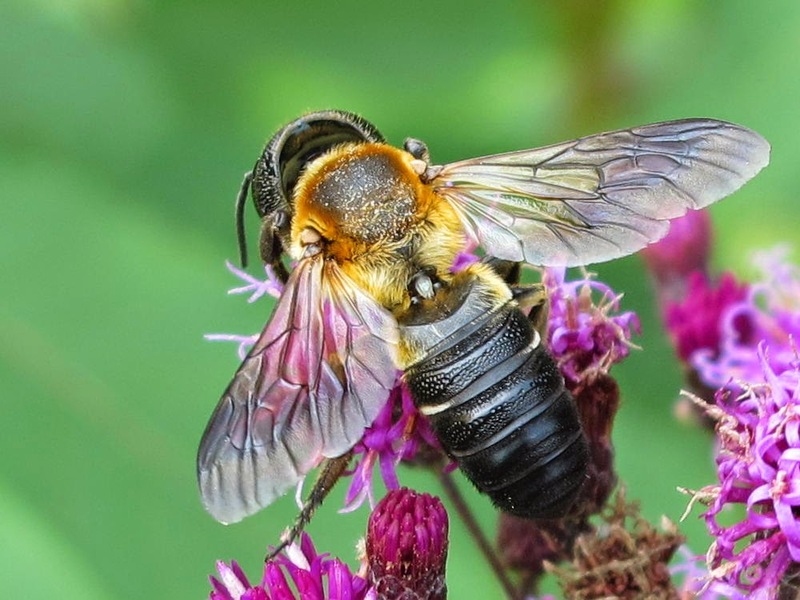 The hair on the thorax was much darker and browner than a normal Carpenter Bee. 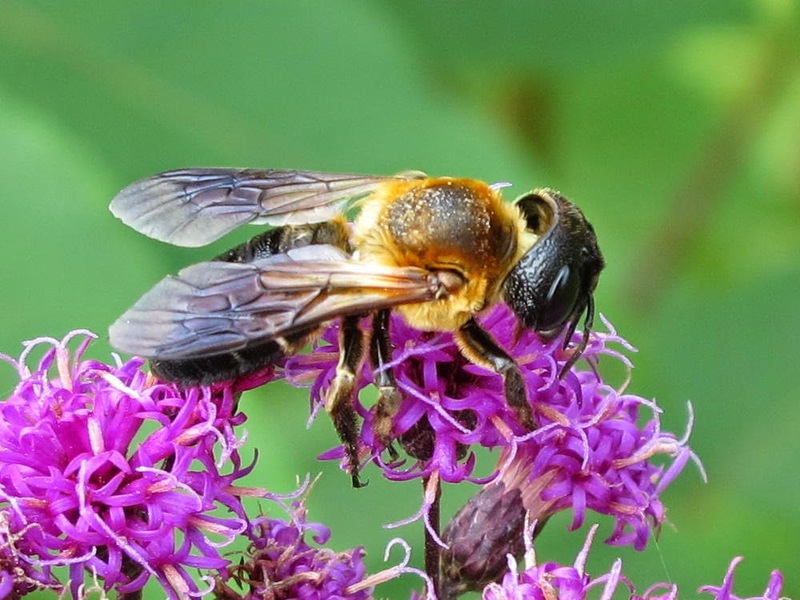 I concluded that I was observing a Giant Resin Bee, an introduced Asian species that is spreading quickly across the Eastern United States. 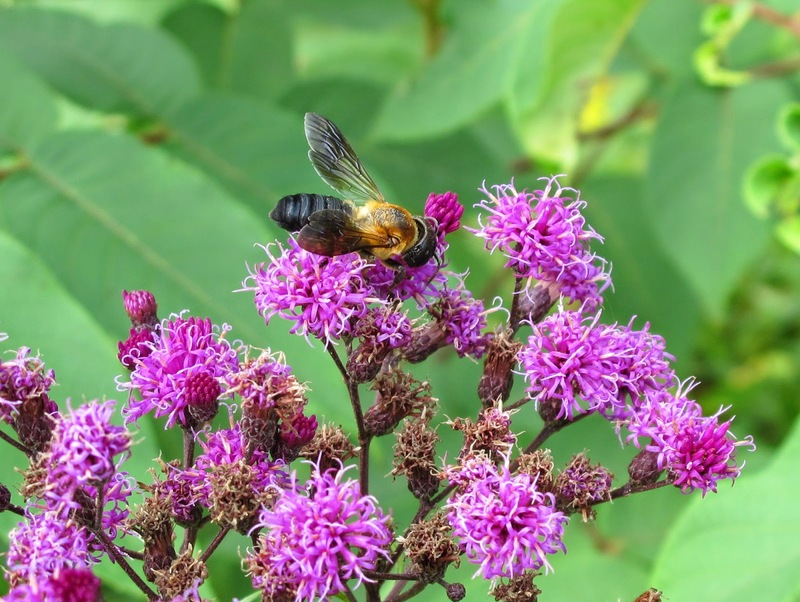 It was really going after the nectar in the Ironweed flowers. At one point it slipped from the flower and hung belly up. After a moment, it began using its front legs to rub the ventral side of its thorax. A few seconds later it slipped farther down and at one point was holding on by a single hind leg. It squirmed back-and-forth much like a dog will do when it finds something particularly stinky to roll in. I figured it was in the clutches of either a crab spider or an ambush bug. I moved in to see if I could spot the predator. As I leaned closer, the bee snapped back upright and gave me a threatening look. 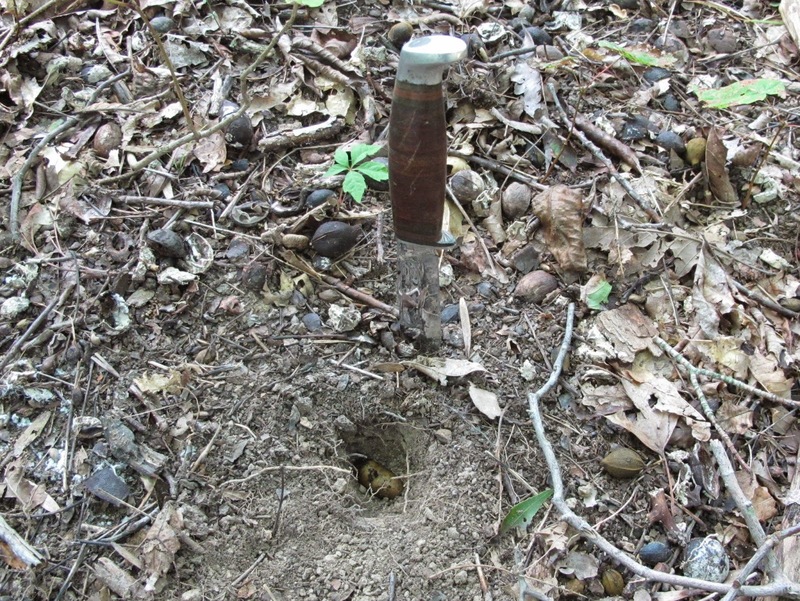 Whatever its strange behavior had been, it had nothing to do with being snared by a predator. I pulled back slightly and the bee resumed its foraging. 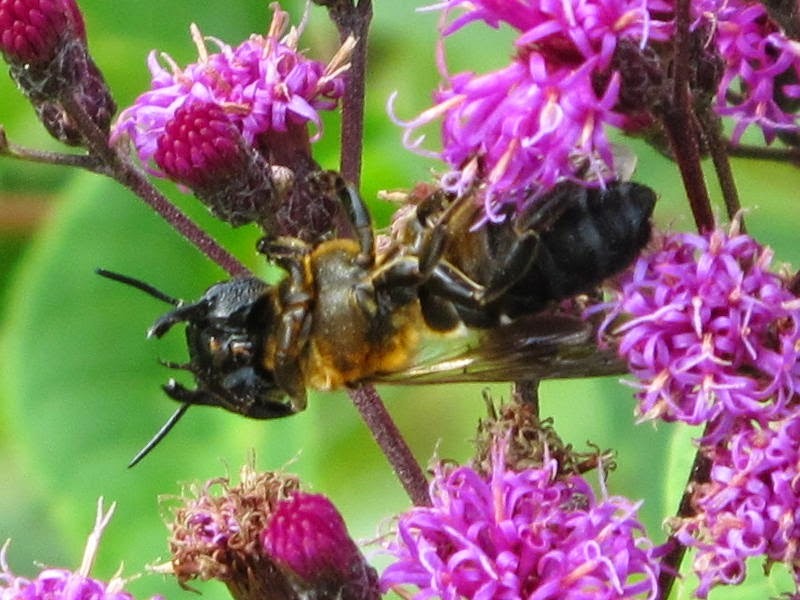 I’ve never observed a bee that moved so clumsily about on the flowers. It fumbled around like it had six left feet. Here it made a belly flop on the flower with its legs hanging free on either side. Eventually it flew off. This was an interesting encounter, but I’m never thrilled to add another non-native species to my list of Blue Jay Barrens residents. I was wandering through the field, tracking down the last of the Teasel, when a female Goldfinch suddenly shot out of this small Flowering Dogwood. I’m used to Goldfinches chattering away as they move around in small flocks from one feeding site to another. A lone bird hiding in a tree must mean there’s something special about that tree. I moved closer and could detect a brown mass concealed by the leaves. 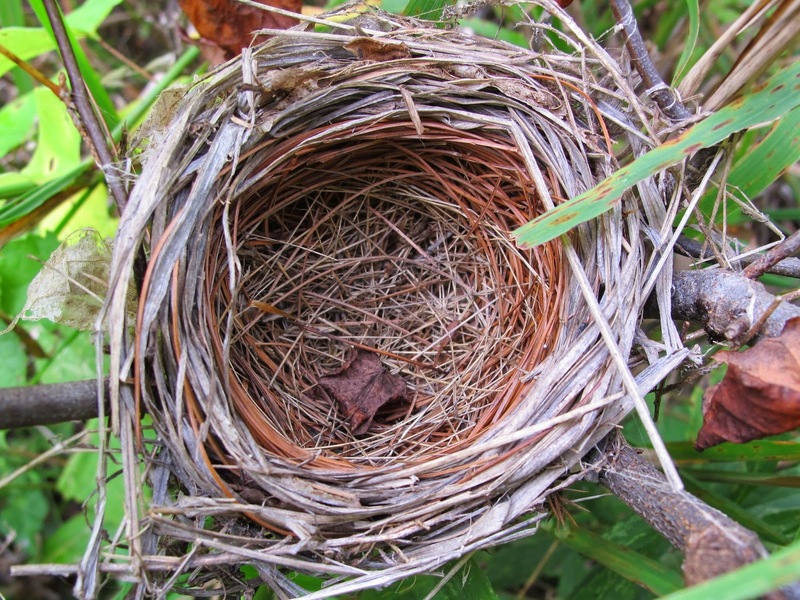 A nest. 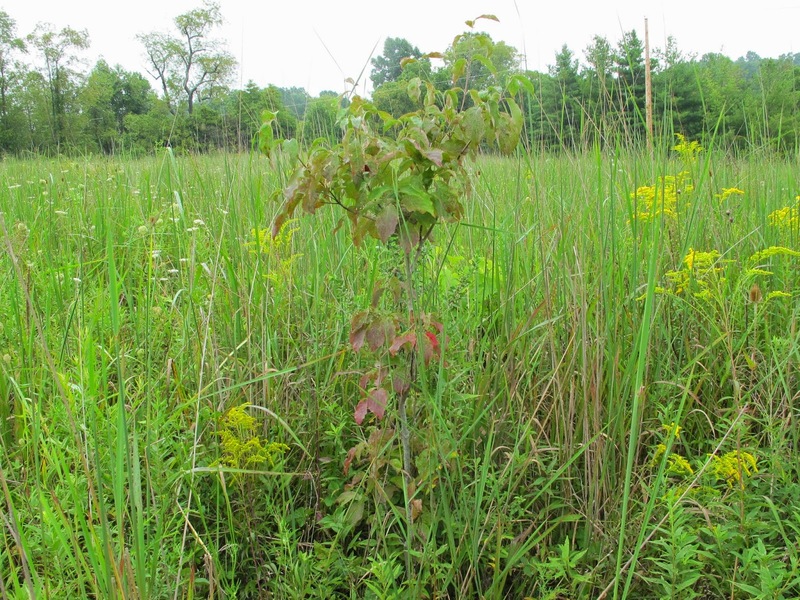 Small shrubs and trees in a generally open field are heavily utilized as nest sites by many bird species. 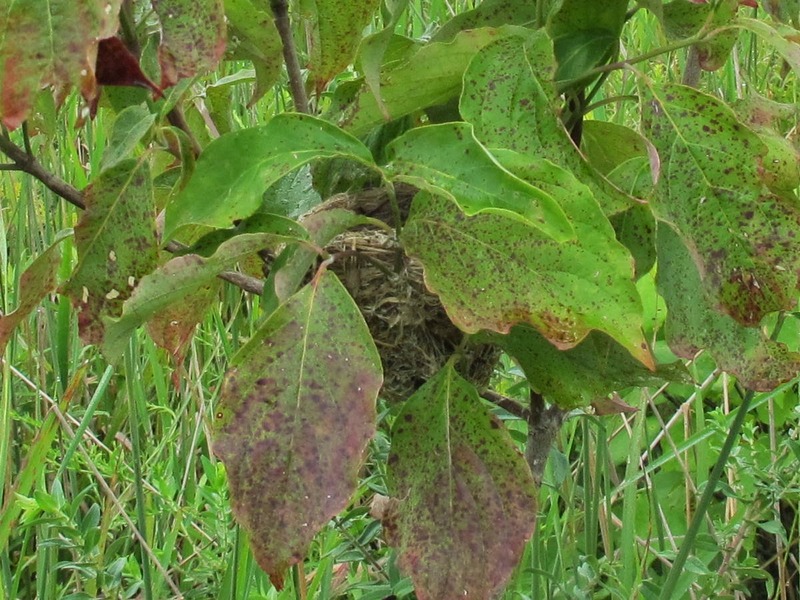 The nests are difficult to see while the leaves are on. 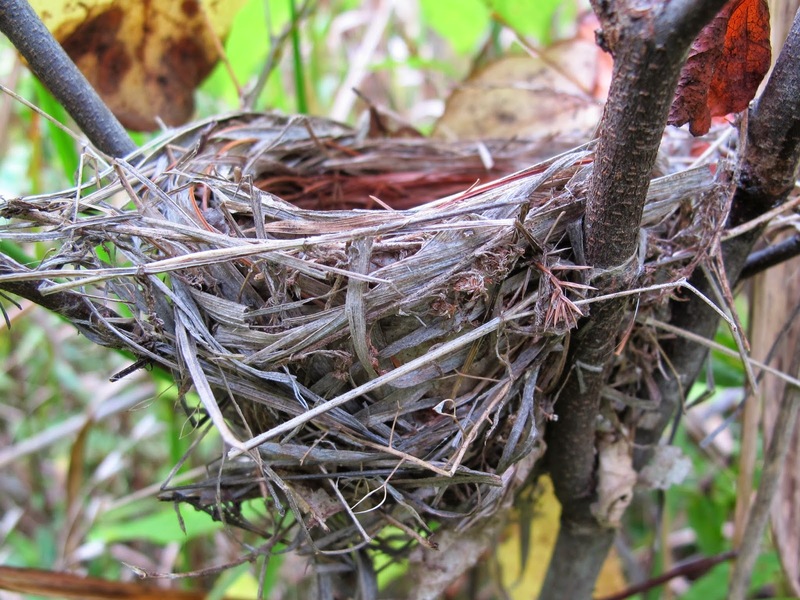 In early winter, when the leaves have all dropped, the nests are quite conspicuous. 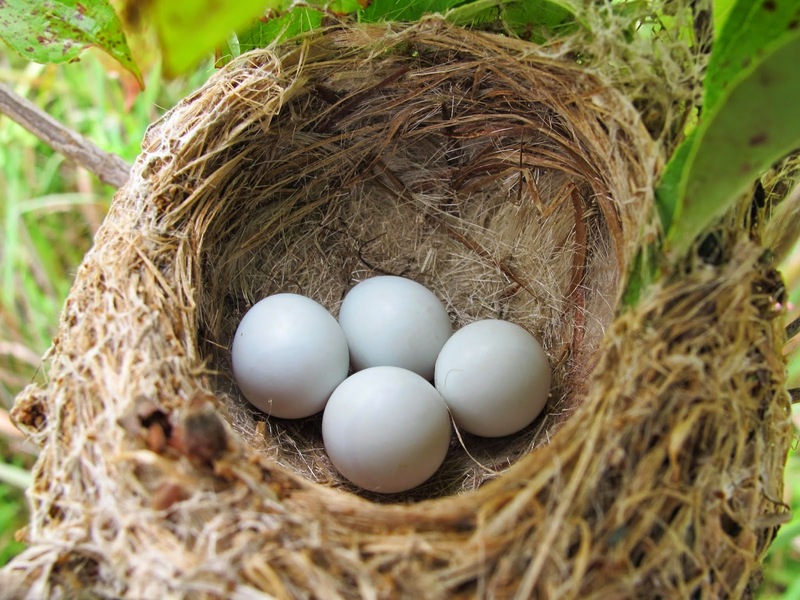 Goldfinches typically lay between four and six eggs, so this nest could still receive another egg or two. 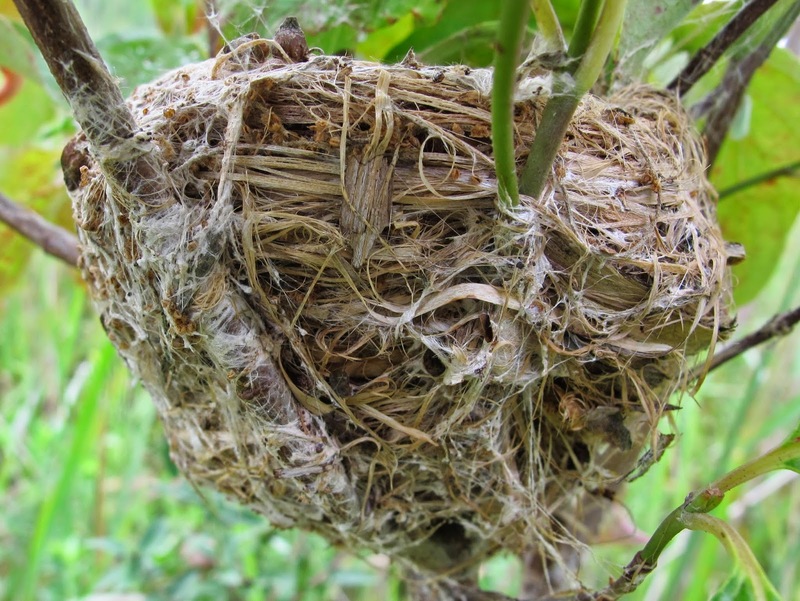 The nests are commonly lined with pappus collected from thistle seed heads. Pappus is the fluffy material attached to the thistle seed that allows the seed to be lifted by the wind and carried to distant locations. The tall thistle species are just beginning to bloom at Blue Jay Barrens, so they are not yet a source of pappus. I believe this nest lining came from the shorter and earlier blooming Pasture Thistle, Cirsium pumilum. There’s not much chance of this nest being dislodged from the tree. The sides of the nest are strongly anchored to a half dozen stout branches. 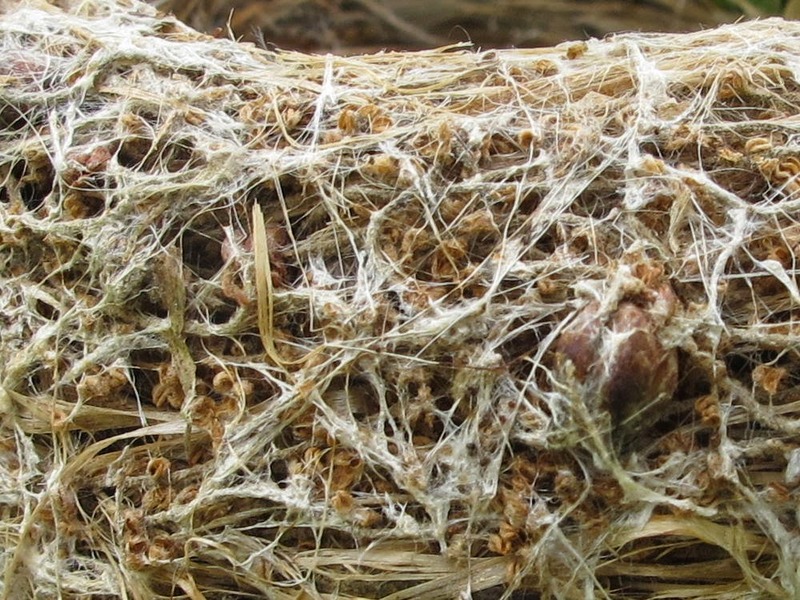 Spider webs are used on the cup edge and the outside of the nest to help hold the material in place. While admiring the Goldfinch nest, I noticed a similar brown mass in a nearby Redbud. I believe this to be the nest of an Indigo Bunting. I’ve seen active bunting nests and this matches what I’ve seen before. 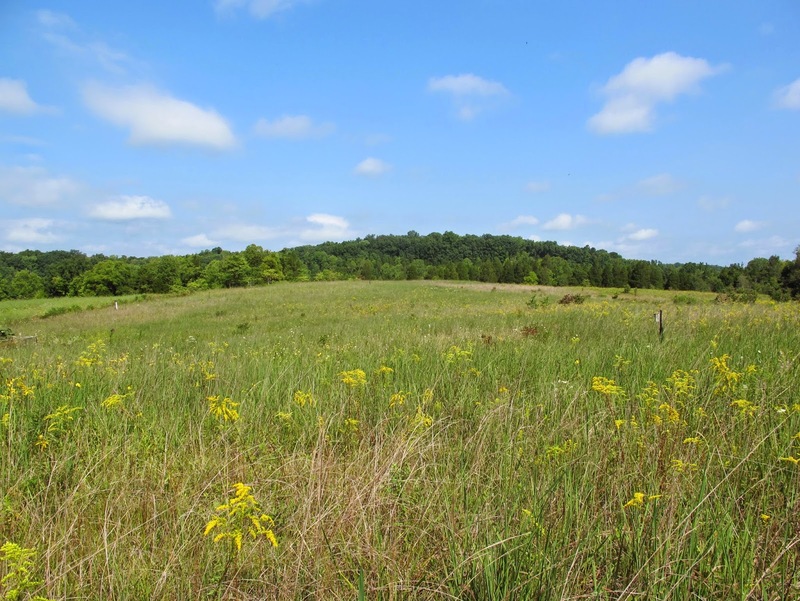 I periodically remove the trees and shrubs growing in this field when they begin to overtop the prairie grass. When they are small, the trees serve a valuable function as nesting structures. Fortunately, there are always new volunteers coming along to take the place of those specimens I remove. 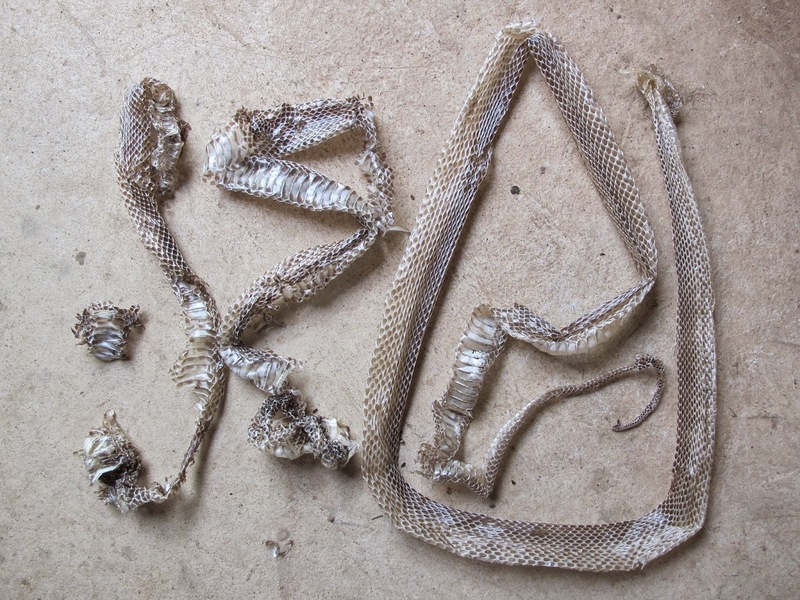 I noticed some mouse activity around the stored bird seed in the garage, so I knew that the Black Rat Snakes had moved out of the house. 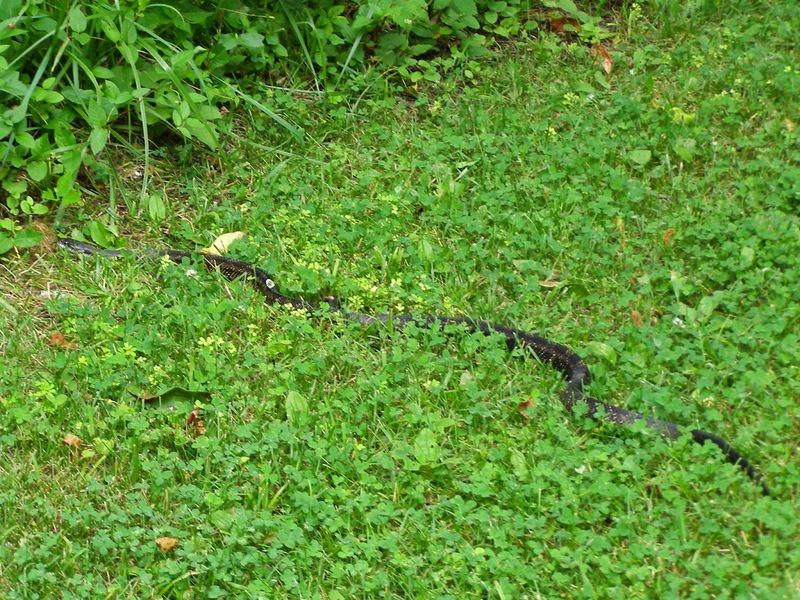 Like many predatory species, the Black Rat Snake breaks its home range into hunting parcels. It will hunt in one parcel until the prey becomes scarce and then it will move into the next parcel. By the time it has made the circuit through all of the parcels, the prey will have rebounded in the first parcel and hunting will again be good. My garage and attic make up one parcel. 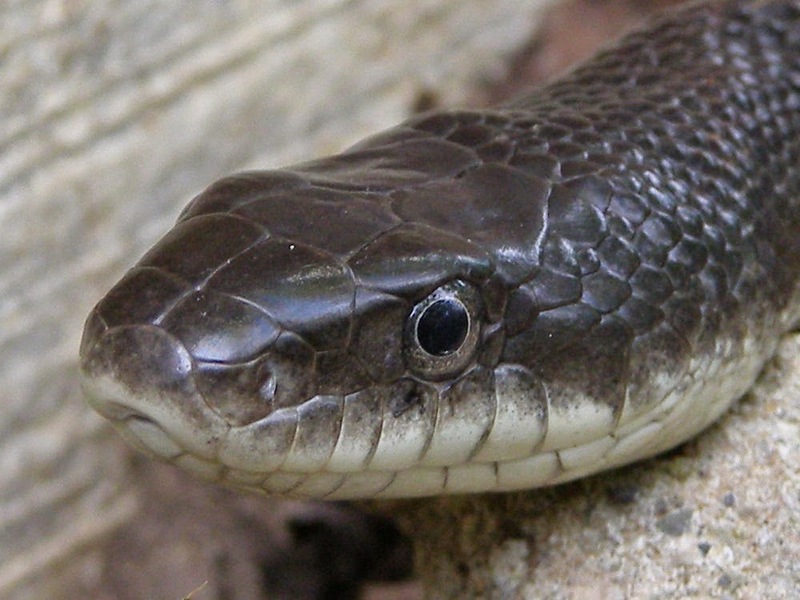 Black Rat Snakes become more uniformly dark as they age. 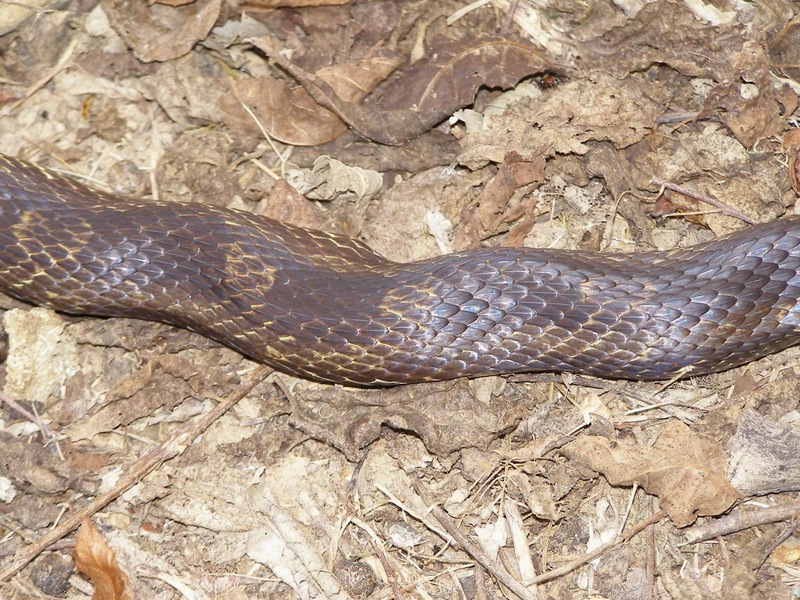 In good light though, you can still see a remnant of the handsome pattern worn by the snake as a youngster. 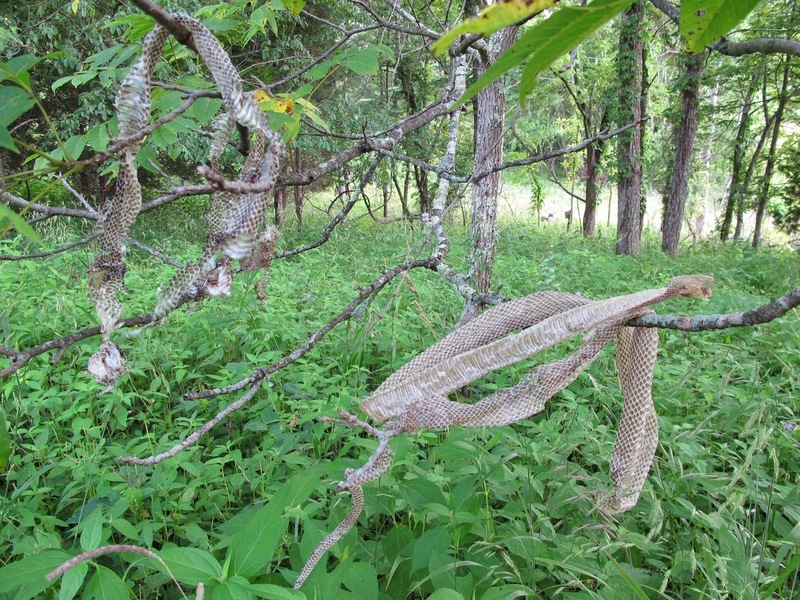 Snakes moving across a loose substrate cannot get the leverage they need for smooth gliding locomotion. They must use their muscles in a different way to achieve something similar to a belly crawl. This is their equivalent of a person crossing an icy parking lot. I’ve heard people attribute this condition to snake arthritis, road accident, dog attack, vicious clubbing and many other imaginative afflictions, but it is really just a natural condition for the snake under certain circumstances. 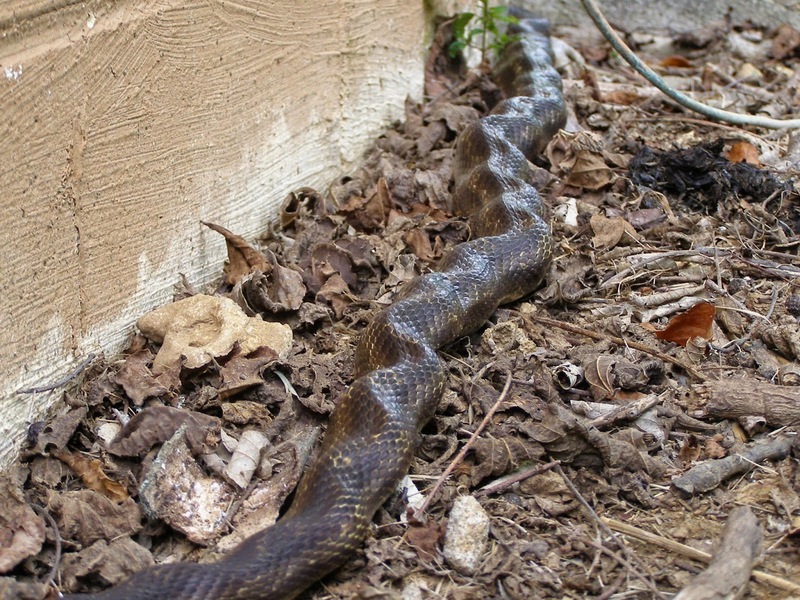 I found this snake coming around the corner of my barn and noticed that it was in a perfect position for estimating its length. This wall was built with standard concrete blocks which are 16 inches in length, including the space between blocks, when in place. 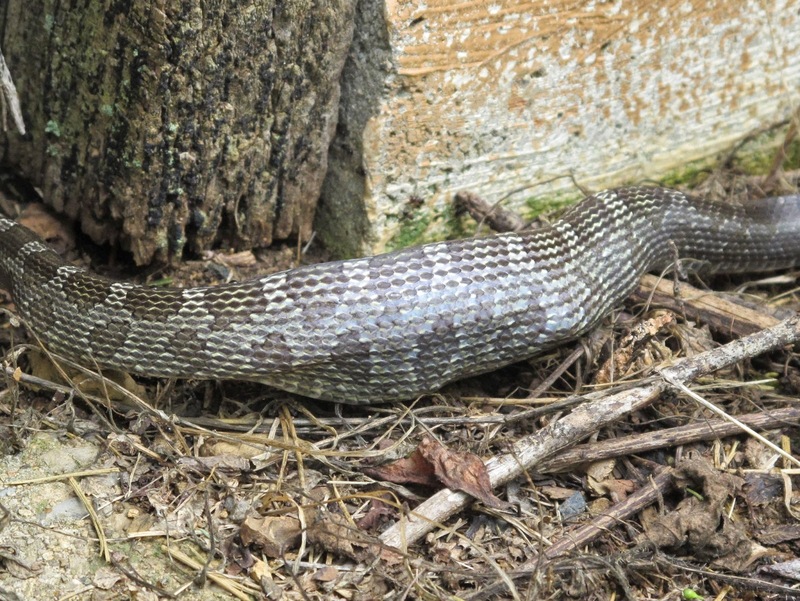 The front part of the snake stretches two and a half blocks or 40 inches. Around the corner we find the tail end stretching about four fifths of a block or 13 inches. 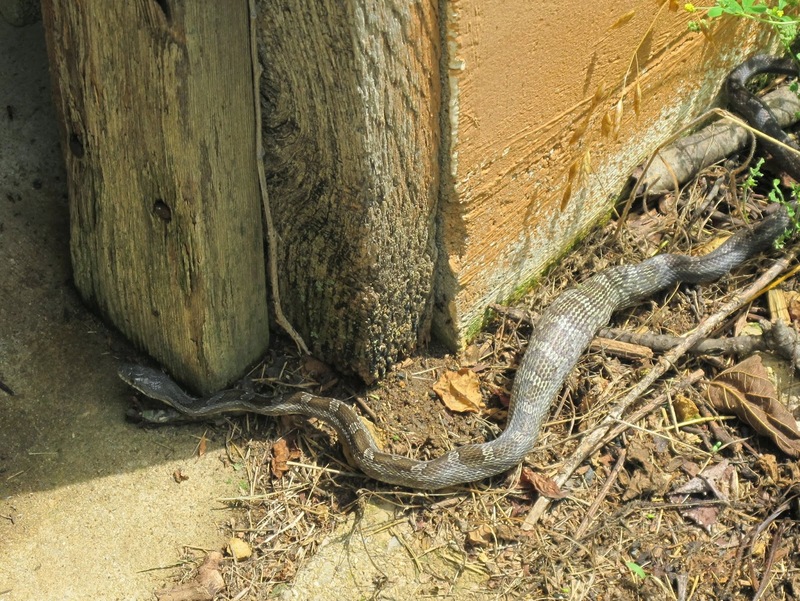 Add on another inch to cover the portion that wraps around the corner and the snake totals 54 inches or four and a half feet. An impressive specimen. 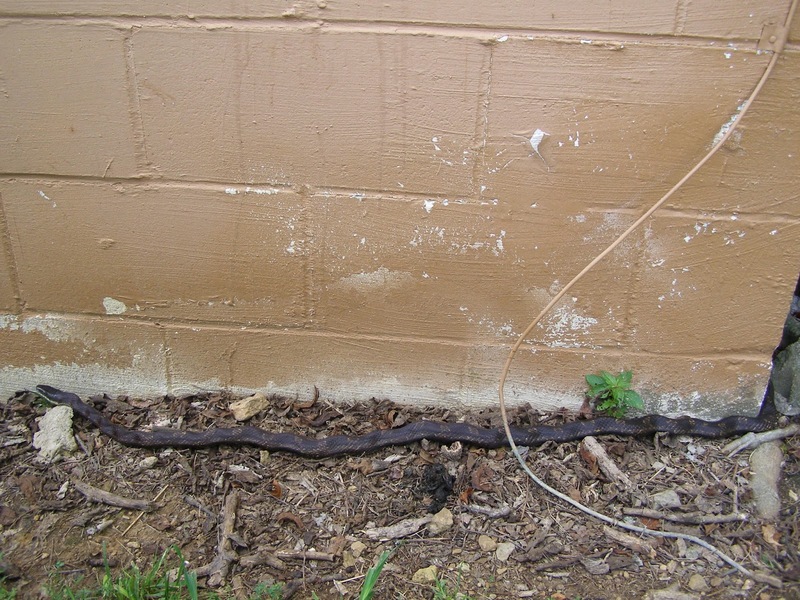 The snake proceeded along the wall and entered the barn by way of the small space beneath the large barn door. As soon as it got inside, it began scaling the wall. These snakes are excellent climbers and easily ascend what is practically a smooth vertical surface. 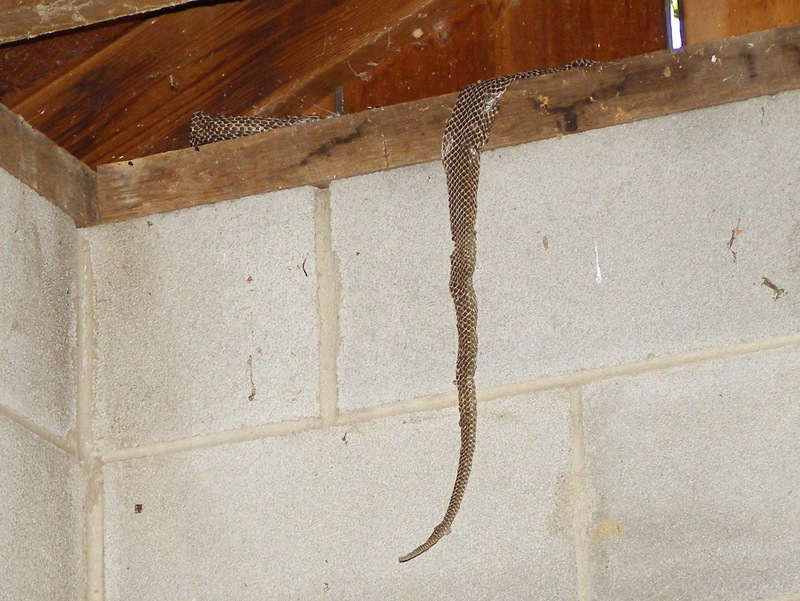 The shelf atop the barn wall is a preferred site for shedding old skin. 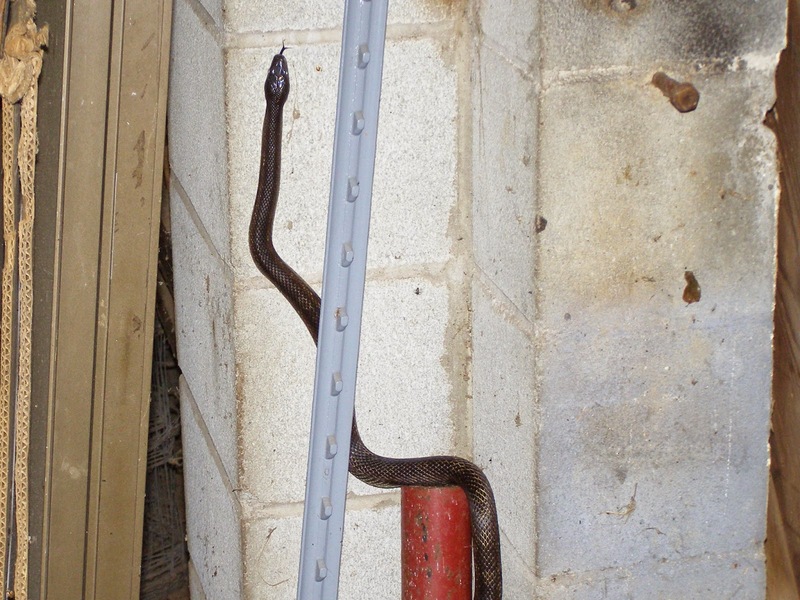 This is usually my first indication that the snakes have moved into the hunting parcel that includes the barn. Here are three fresh sheds, all left within the past week. I usually take the skins and hang them in a nearby tree. 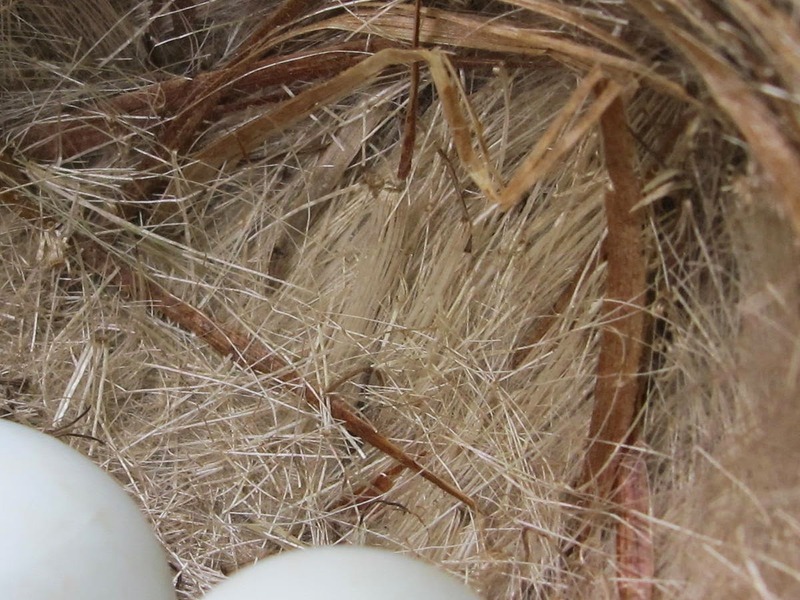 With luck, there will still be some lengths of skin around next spring that are suitable to those birds that use this type of material in their nests. 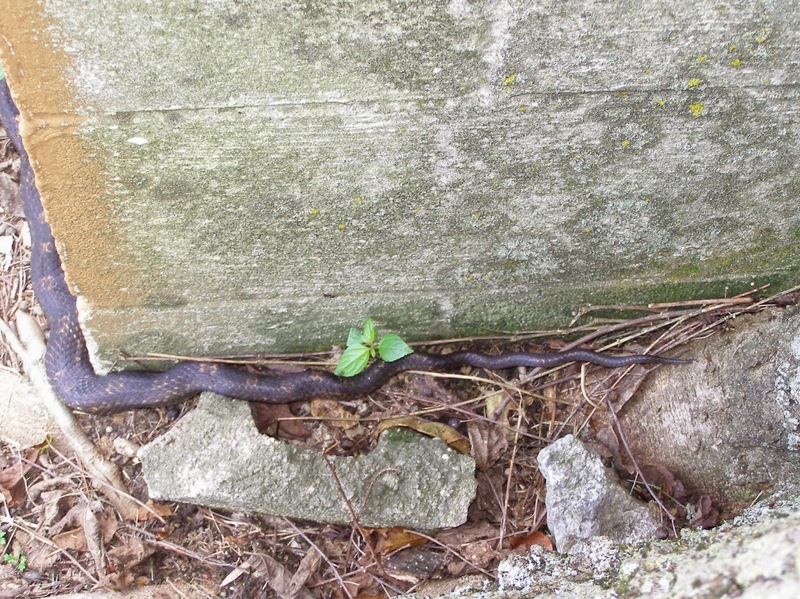 While I was exiting the small barn door, this young snake was trying to enter. Its juvenile pattern is clear to see. 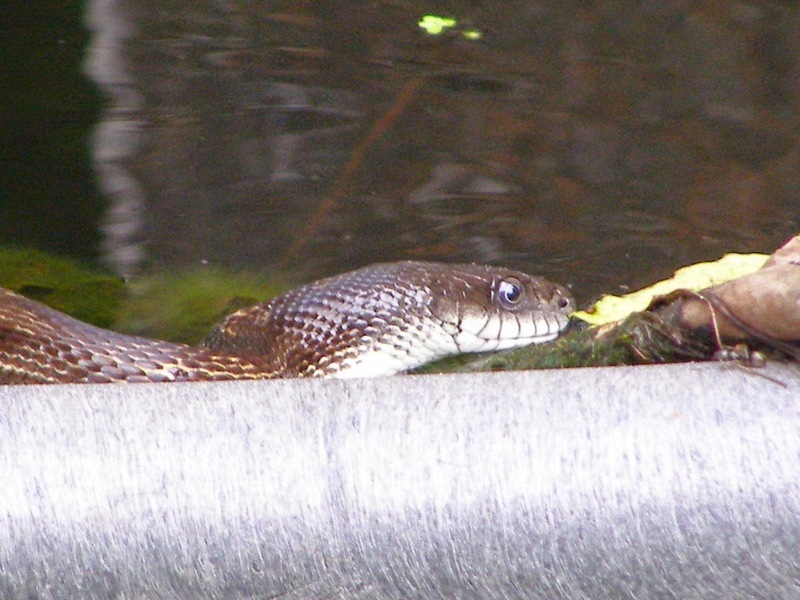 The small snake showed signs of having recently fed. I hope that bulge represents a small mammal and not one of the adult fence lizards. 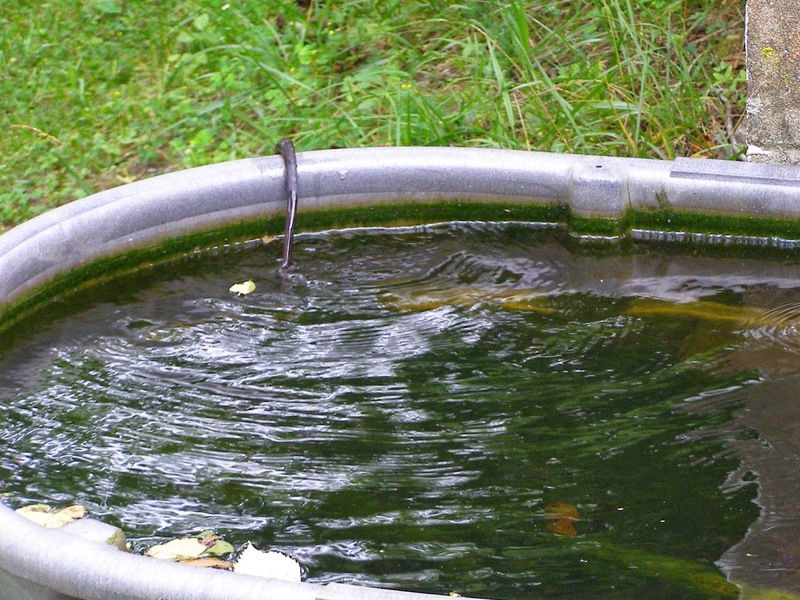 The water tubs at the barn corners are frequently used by the snakes. 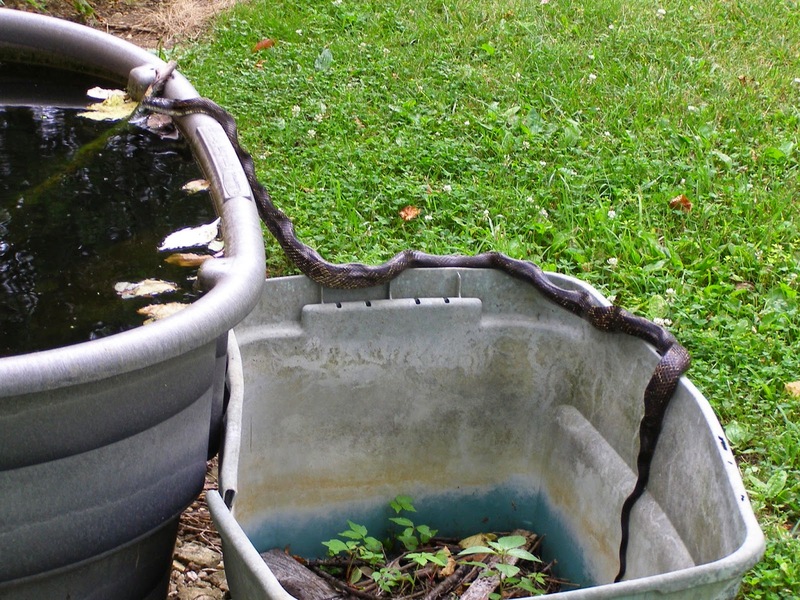 I usually see the snakes scale the barn wall to access the water tub. This one chose to employ the stepstool method. Large quantities of water are often consumed at one time. This one drank for almost a full minute. 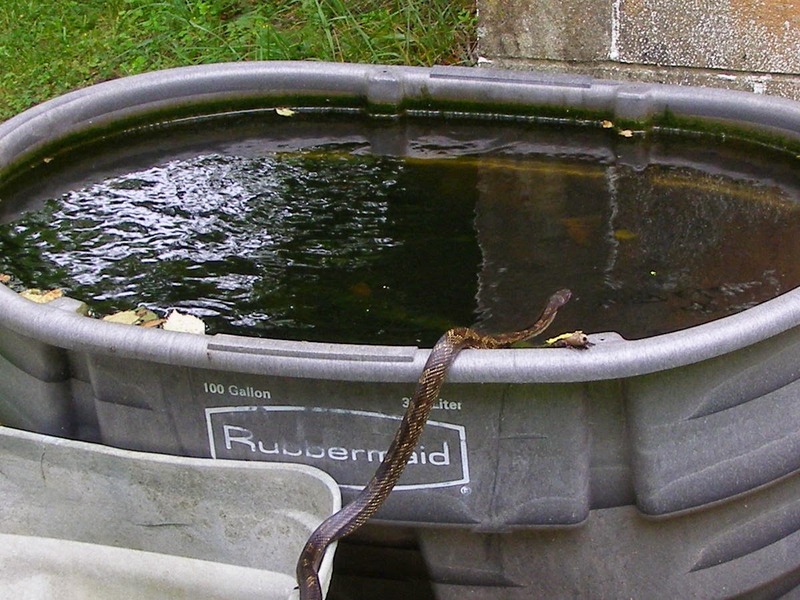 The snakes sometimes soak in the tub and I thought this one was going to do just that. Instead of soaking, it shot through the tub and out the other side so fast all I could catch was the tip of its tail disappearing over the back side. It took off across the grass and entered the field beside the barn. 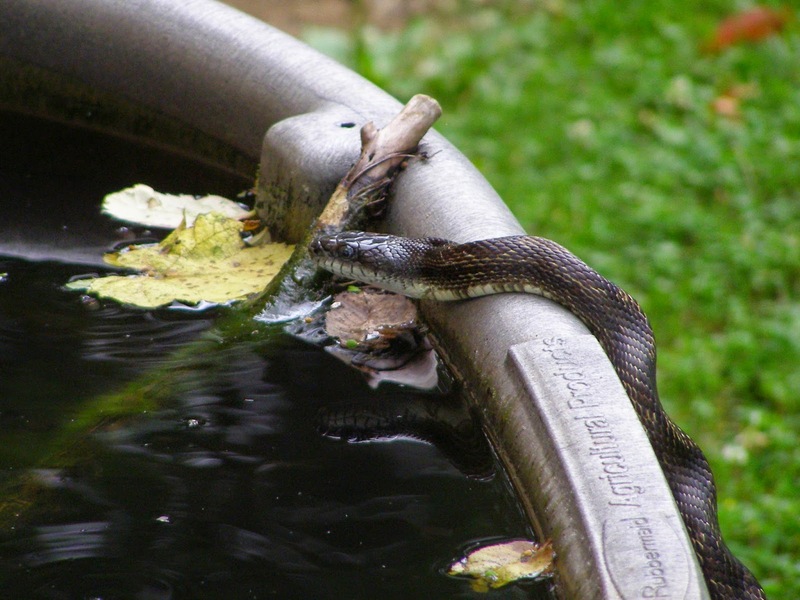 It’s fun to watch these snakes going about their business undisturbed.